This topic describes the changes made to ReadyAPI version 2.6 relative to the previous version – 2.5. For information on the changes made to other versions of the product, see Version History. Smarter API Discovery. You can now specify an API for which you would like to record requests. ReadyAPI will record requests and responses only for those operations that this API mentions, and will automatically skip requests to other third-party services. This will make the recorded test cases a great deal clearer. For more information on this, see Record Test Case Tutorial. The “record all requests” mode that existed in previous versions is also available in version 2.6. Built-in support for extended HTTP methods: PROPFIND, LOCK, UNLOCK, COPY, PURGE. 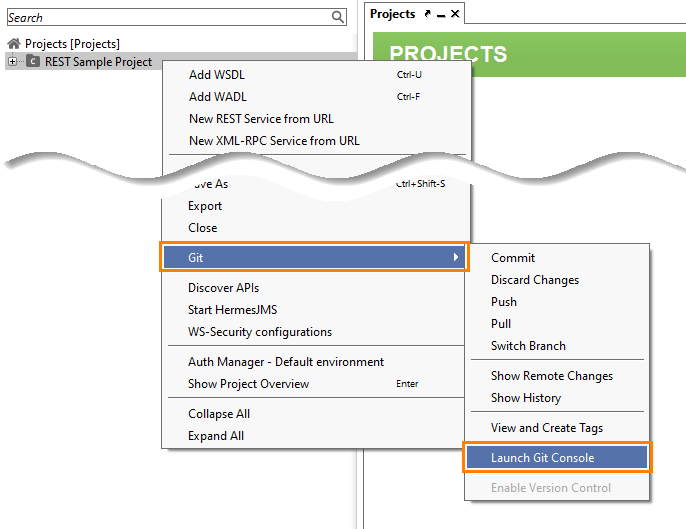 You can use these methods for testing and exploring REST APIs. Now it is possible to view the difference between file versions when you are committing or discarding changes from the ReadyAPI UI, or when you are viewing remote changes in ReadyAPI. The menu items you use to interact with Git repositories have got clearer names that match native Git commands (commit, pull, push and so on. See the image above). ReadyAPI now supports Postman collections ver. 2.0 and 2.1. You can now import collections from local files, as well as from HTTP and HTTPS endpoints. ReadyAPI automatically creates test case names based on the request names in the imported Postman collection. Formerly, you had to specify a name for each test case manually. Support for SwaggerHub On-Premise. 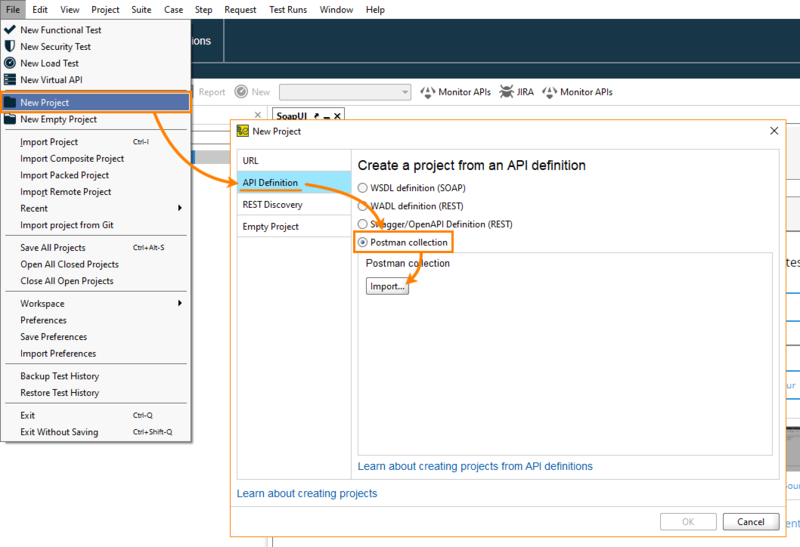 You can now easily import API definitions located on SwaggerHub On-Premise servers and publish APIs from ReadyAPI to SwaggerHub On-Premise instances. Earlier, in the WS-Security configuration dialog, you could choose the keystore file only when creating a new configuration. Now you can set the file name at any time later. Also, now you can specify a relative path to the file or use a property expansion in the file name. The SSL Keystore property of the SOAP Request step can obtain a configuration name only. So, if you change the keystore file name in a configuration, the changes will be applied to all the test steps that use this configuration. In legacy projects, this property can refer to a keystore file, not to a configuration. ReadyAPI 2.6 will keep the property value until you change it. If you use the property value in some of your scripts, you will have to update the script code, because now the property returns a value of the object type instead of a value of the string type. The request editor now automatically hides tabs that are not applicable to the request being edited. For instance, in previous versions, the request editor showed the JMS Headers tab even for those requests that didn’t send JMS requests. Now this tab is hidden. The dialog automatically hides assertions that cannot be used in the current context. Quick search for assertions: you can easily find an assertion by typing part of its name or description. The dialog displays all the assertions in a list and automatically switches the assertion category on the left when you scroll this list. The Data Sink test step offers an updated editor for working with Excel data sources: the editor UI has been simplified and is now more convenient. ReadyAPI 2.6 includes newer versions of some libraries that version 2.5 used. If your scripts refer to classes from these libraries, you might need to update them. You can now select test cases for a run by combining tags with the logical AND, OR and NOT operations in TestRunner’s command line. See Working With Tags. Printable reports now include information about the 5 fastest and 5 slowest test cases. The new 75 percentile metric has been added to LoadUI reports. The MSSQL monitor now supports named SQL Server instances. LoadUI offers the new Microsoft SQL Server 2017 monitor with new SQL Server XTP (In-Memory OLTP) counters to help you analyze the SQL Server performance. Now you can run multiple virtual services on the same port. The only requirement is that they use different paths in URLs.